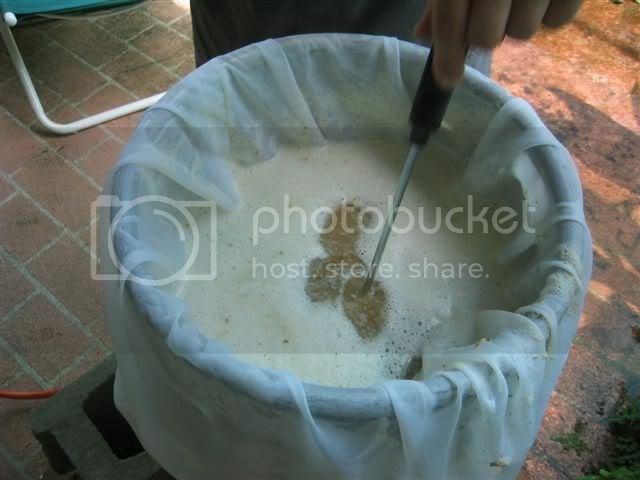 Brew in a Bag (BIAB) all grain beer brewing is a new method for all grain brewing that originated in Australia. BIAB is an inexpensive way to for homebrewers to transition to all grain or partial mash brewing. Brewers also enjoy brew in a bag methods for the shorter setup, brewing and cleanup times. For an all grain batch, you need a full size (batch size plus a few gallons) boil pot and ideally a propane burner to quickly boil it. For partial mash brewers, a smaller pot (3-4 gallons) is acceptable as you will not be mashing or boiling the full size of your batch. The brew in a bag method eliminates the need for a mash tun, hot liquor pot, or lauter tun. The only other equipment needed (aside from normal extract brewing equipment) is a large grain bag. The bag should be made of a mesh material and sewn together like a great pillowcase. It should be large enough to cover the entire inside of the boil pot, and have a drawstring or tie at the top to allow the bag to be closed. The bag will line the boil pot and closed to hold the grains during the mash. At the end of the mash the bag is slowly withdrawn and the remaining wort is boiled, cooled and fermented as any beer would be. Brew in a bag is usually done using a single step infusion mash, the same profile most all grain brewers use. This involves preheating the water in the mash tun to a predetermined temperature before adding the grains. In a major departure from traditional methods, the entire pre-boil volume of water is used for the mash. In BeerSmith, you can do this by choosing a single infusion, no mash out mash profile and then setting the first mash step volume (choose details next to the mash profile, then double click on the first step) equal to your boil volume. You can also use the infusion tool to calculate initial strike additions, setting the strike volume equal to the initial boil volume for your batch. For a partial mash BIAB, less water is typically used – but again it is equal to your starting boil volume. Once the strike water is heated to the appropriate starting temperature, the bag is added to line the edge of the boil pot, and the grains are added. Done appropriately, you should come very close to your target temperature for mash conversion – usually between 148 and 156 F.
Once you reach your target mash temperature, it is best to cover your pot and maintain the temperature as steady as possible for the next 30-60 minutes while the complex sugars in the grain are converted to simple ones. You can also wrap the pot in towels to help maintain temperature. After the mash is complete you have the option of heating the mash slightly to a mash out temperature (around 168F). If you are planning to heat the pot while the bag is still in it, you do need some kind of screen or false bottom at the bottom to prevent the bag from getting burned or melted by direct heat from the burner. For BIAB, the mash out aids overall extraction efficiency when you remove the bag. Finally, slowly lift the grain bag out of the pot and let it drain. Once the bag has drained you can empty it, spray it down and clean it off for reuse on your next batch of beer. From this point forward, the wort left in your boil pot can be boiled, cooled and fermented just as you would any batch of beer. If brewing all grain, simply boil the wort with hop additions, cool it and transfer to your fermenter. For partial mash, you can add your extract, hops and continue to brew. Equipment Cost – If you have a large brew pot already, the only additional equipment needed is a bag, which you can make yourself if you have access to a sewing machine. Simplicity – Brew in a bag lets you move to all grain or partial mash brewing in a simple way, and the method itself is very simple to set up and execute, even with limited space. Batch Size – All of the grains have to fit in the bag, and the bag has to be lifted out without breaking, so this does place some limitations on high gravity batches. However with a properly stitched grain bag, double batches are possible though a pulley may be desirable. Efficiency – Since BIAB is a full volume method, you will lose a few percent efficiency – overall batch efficiency is usually lower than with fly sparge methods. However, this can easily be compensated by adding a little more grain to the batch and formulating your recipes with the appropriate lower brewhouse efficiency estimate. Experienced BIAB brewers have reported efficiency as high as 80% in some cases. I hope you enjoyed this week’s article on brew-in-a- bag. Thanks again for visiting us on the BeerSmith home brewing blog. Don’t hesitate to subscribe for regular delivery, and have a great brewing week. I am an exclusive brew-in-a-bagger and I disagree with two disadvantages. Batch size: I just participated in a partigyle where I produced one and a half beer in my BIAB mash tun and a fellow sparger produced one and a half beers in his. The two halfs were mixed together so we had 3 beers from two tuns. Each tun had 24 pounds of grains. I did a Tripel and half of a Dubbel. So yes, high gravity beers are totally achievable. I even got a bonus sour beer out of my mash by tossing the bag in a cooler with 160F water for 24 hours before boiling. Efficiency: I get better than 70% efficiency. Double crush the grains, do a mash out, and squeeze the heck out of that bag. Want to really boost efficiency, then do a 90 minute mash with the kettle wrapped in an old comforter or sleeping bag. Also, it is much easier to just use a cookie rack in the bottom of the kettle and put the bag in before heating the water. Use office binder clips to hold it to the sides. Make a bag out of swiss voille from the fabric store, stitch a high strength seam and you’ll be fine with almost any amount of grains. I don’t have enough BIABs under my belt to compare the body or dextrines. But I have done pale ales and porters. Both had the correct body for the style. Hey Deaksy, where did you get the Birko Water Heater? How much did it cost, and can you send me a link to one so I can check it out myself. Sounds like a great idea! I’m also doing BIAB partial mashes. But I sparge my grains by using a two pot system. – While that’s mashing (I pop the covered pot in a warm over to help maintain the mash temp), I heat around 5 litres of water in my larger brew pot (4 gallon) to sparge temp (around 75C). Once the mash is complete, I slowly raise the bag out of the pot, squeeze it as much as possible, then lower it into my brew pot for the sparge. – Gently poke and prod it in there for about 10 minutes, remove the spent grain bag, and you now have your second runnings. – Then gently pour (or siphon) the first wort into the brew pot and start your boil. I’ve managed to get around 80% efficiency this way. I belong to a brewing club, we do almost exclusive BITB brewing. Our efficiencies are hitting 85-88% every time. I will say that our methods are a bit more sophisticated than the article lays out. We generally use a 1lb. to 3gal water to grain ratio for our initial mash. We then allow for a 10-12 degree drop instantly after grains are added to the pot of water. So if your trying to mash at 152F you heat to 162-164 drop your grain bag in give it a good stir drop a lid on it for 60 min. Your temps tend to sit around 150-154. You then grab your bag pull it out letting it drain, then drop it into a bucket and sparge with 170F water. Repaet this 2-3 times until you get your boil amount. Thanks for the blog post and link back to the original article. I am intrigued by the BIAB method, both due to the simplicity of the method and the small investment required. At my local brew club meeting I asked if anyone had tried it and no one had, so if I can pull it off successfully it may produce some converts! BIAB is becoming very popular in Australia and is becoming the “default” method of getting into all grain brewing nowadays. A number of 40 litre (around 10 US gallon) electric hot water boilers (urns) are available here and these offer an attractive “turn key” solution to setting up an all grain brewery. BIAB, as opposed to mashing in an insulated picnic cooler, is good for stepped mashes, by simply placing a trivet or cake rack over the electric element to keep the bag clear and prevent burning. My normal mashing schedule is to do a German “Hochkurz” mash with a maltose rest, dex rest then a mashout. Because the mash is thin compared to traditional three vessel brewing, heat can be directly applied and the mash stirred during ramping from one stage to the next. We absolutely love your blog and find a lot of your post’s to be just what I’m looking for. Would you offer guest writers to write content in your case? I wouldn’t mind composing a post or elaborating on many of the subjects you write in relation to here. Again, awesome web site! I do all my brewing in a bag. I use regular grainvolumes and normally acchieve 80-85 % efficiency. I pull the bag out, and place it high in the fermentingtun and pump all the sweet wort through the bag again, then squeese it hard. Then I let it wait there for about an hour before, with a siphon, I transfer it back in the kettle. At this point all trub has setteled in the bottom and I stop before any of it reaches the siphon. What I now have is crystal clear sweetwort. This has improoved the result dramatically, compared to boiling all the trub as the article above indicates. I do BIAB too and I have found some of my beers can be slightly astringent. What do you recommend? Should I add some ph stabilizer to my mash? I’m hitting my temps ok. I have been recirculating the wort through the mash prior to removing the bag to clarify the wort. I generally dont mash out. Any thoughts would be helpful. Thanks. Hi Chaps, I have been following your all grain BIAB brewing techniques, it’s the waste that bothers me, I hit 85% to 90% conversion using a full mash and sparging technique and even at the best I lose 10% of the possible extract to the compost bin. Is there a way anyone has found of bettering either method? I’ve brewed good beer since 2006 (before then I used kits). You mention that a high WTG ratio produces less beta-amalyse. In my research the higher WTG ratio impacts conversion positively. The enzymatic conversion of starch to maltose for B-Amaylase is activated in the temperature range of 143.6 to 152.6. See the following from Kai Trauser with references to Dr. Ludwig Narziss and Dennis E. Briggs. The results for mash thickness were somewhat surprising. Contrary to common believe no attenuation difference was seen between a thick mash (2.57 l/kg or 1.21 qt/lb) and a thin mash (5 l/kg or 2.37 qt/lb). Home brewing literature suggests that thin mashes lead to more fermentable worts, but technical brewing literature suggests that the mash concentration doesn’t have much effect in well modified malts [Narziss, 2005]. Briggs cites data that doesn’t show a change in fermentability when the mash thickness is changed [Briggs, 2004]. This was confirmed by these experiments where all the data points were on the same curve that had already been established in the temperature experiment. To keep the temperature drop between the experiments the same the mash volume was increased and the result was a 2 degree Celsius temperature drop which matched the temperature drop for the 5 l/kg mash. But in the end that didn’t make a difference. R-E-C-Y-C-L-E Brewing | My Lame Beer Blog.